Azores hiking is a great experience at any time of the year. All of the islands offer a variety of hikes in some very interesting spots with great views. Some of the hikes are up in the mountains and others are down along the coast. But they are all picturesque. There are well marked trails of all different lengths and degrees of difficulty on the islands. Most trails are 5 kilometers or longer, but there are some shorter ones and there is the option to only do just do a part of the trail and double back. My favourite hike so far was in Faial da Terra on Sao Miguel. 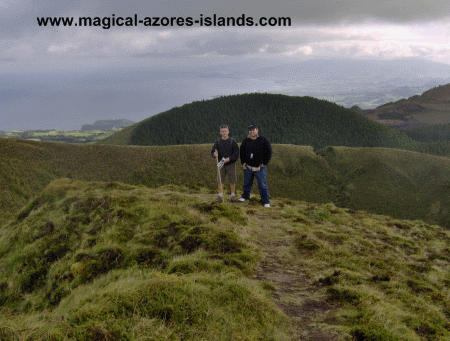 See some pictures at: Azores Hiking in Faial da Terra. The hike is about 5km and with some optional paths you can see an old village and at another spot you can get to a beautiful waterfall called Salto do Prego. You can read more about Acores hiking at www.trails-azores.com. That's a good site with information about all of the trails in the Azores. The site gives detailed descriptions of each hike as well as a map that you can print out. The hikes are described in terms of difficulty, changes in elevation, and distance.